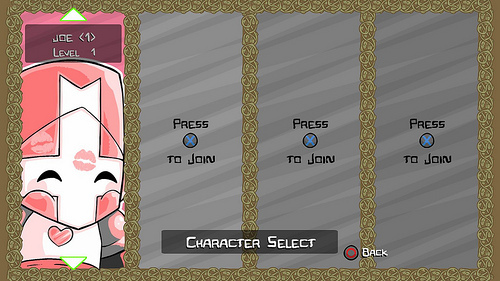 Note that you do have to beat every level with the first character in order to unlock the second character. 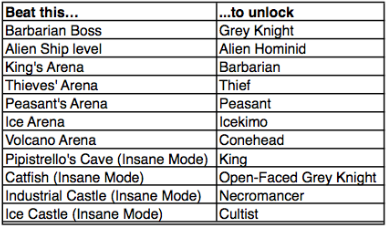 You can’t just skimp out and beat the last boss; every single level has to be completed in order to get the unlock. It’s slightly different for the XBLA version, given that some of those characters are DLC and not unlocked in the way described, but that’s the gist of it. Note that the Arenas must be beaten solo. If you enter an arena with multiple players, it becomes a multiplayer arena battle, not an arena challenge. You can do this in the single player arena mode, but I recommend doing it via the normal game so you have access to potions. Don’t forget that when playing solo, you have to manually activate your potions when you’re near-death; they don’t pop automatically like they do in multiplayer mode! So basically if you want to unlock the Ninja Pirate, you have to first beat the game with the Orange Knight to unlock the Fire Demon, then you have to beat the game with the Fire Demon to get the Ninja Pirate. If you want the Cultist you have to beat the Ice Castle level on Insane Mode. Etc. Etc. 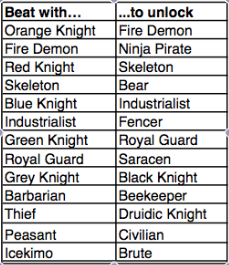 Follow the above charts and you’ll be good to go to finish up your roster before the Pink Knight arrives on Tuesday! « Gaming and Driving: New study says…what, exactly?